When I arrived to Florence, I stayed at the luxurious apartment at Canto degli Scali. This place is a beautifully restored and converted from a 14th century palace in the center of Florence into a series of charming apartments. Each of these units has been named after a Florentine “Canto” and they are all furnished with custom fittings. This makes them exquisitely unique and gives our hosts the impression of being in a real home from home. 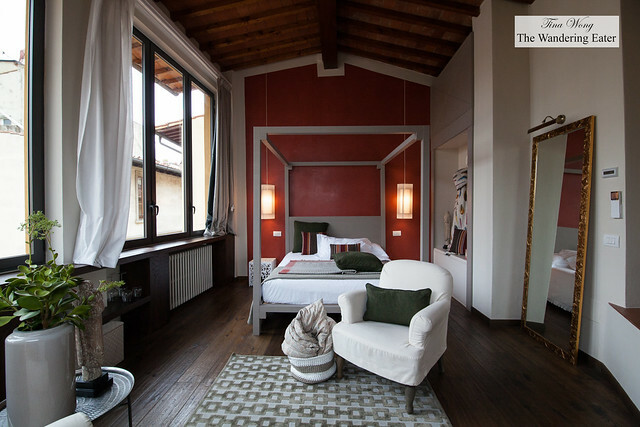 The idea for this project came from two brothers, Marco and Alessio Ducceschi, who were personally responsible for the restyled design of the property and are now ready to offer you a friendly, but professional welcome and do everything they can to make the stay unforgettable. I’ve stayed at Canto del Giglio Rosso suite. 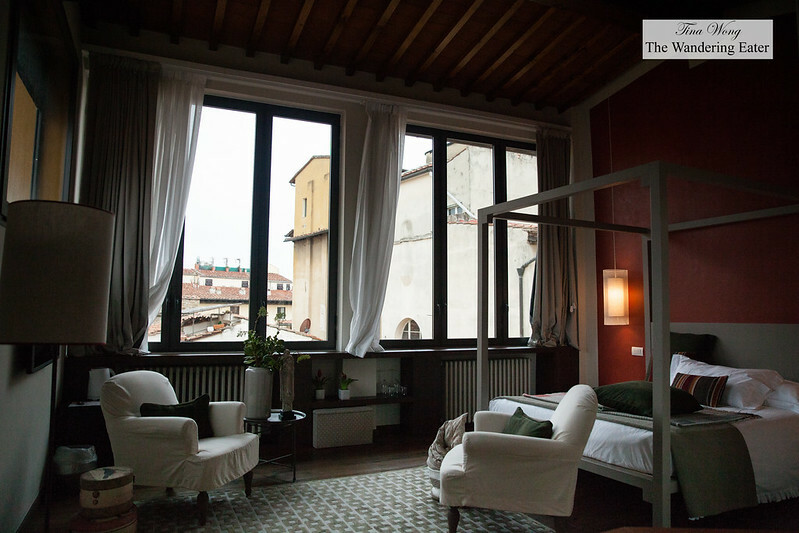 It’s a two-floor room that the first floor can work as a separate bedroom or seating room with a window with a view of the charming Florentine terracotta rooftops and large open closets and extra blankets for those chilly nights. Upstairs is the master bedroom area with a wall of windows of the similar view downstairs but much more breathtaking. 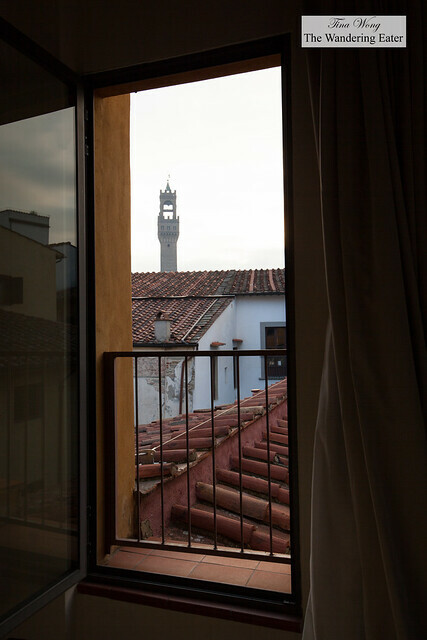 If you sit at the bed, there’s a small window across the way with a peek of the clock tower of Palazzo Vecchio. It’s incredibly charming and cozy and it does feel like an upscale apartment rather than a commercial hotel room. 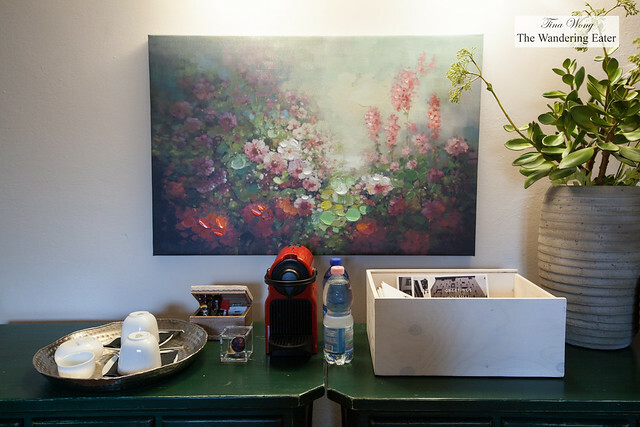 WiFi is provided throughout the property. 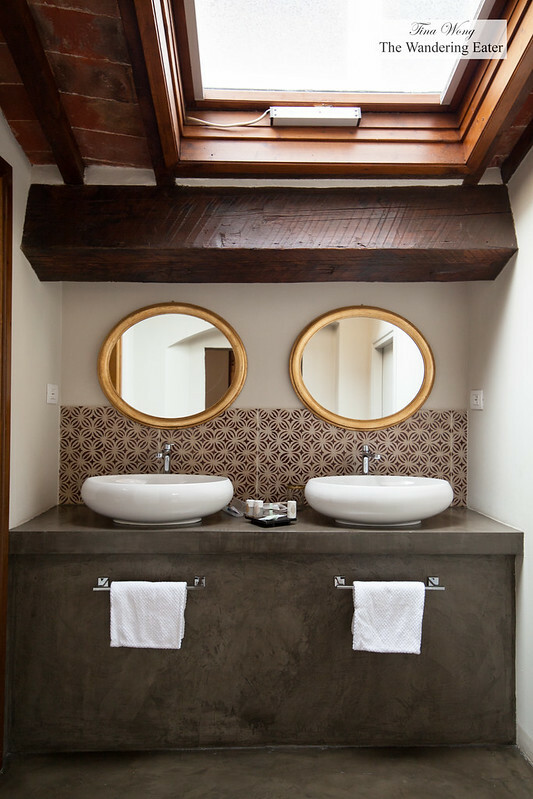 The room has a large double vanity sink just outside of the bathroom. 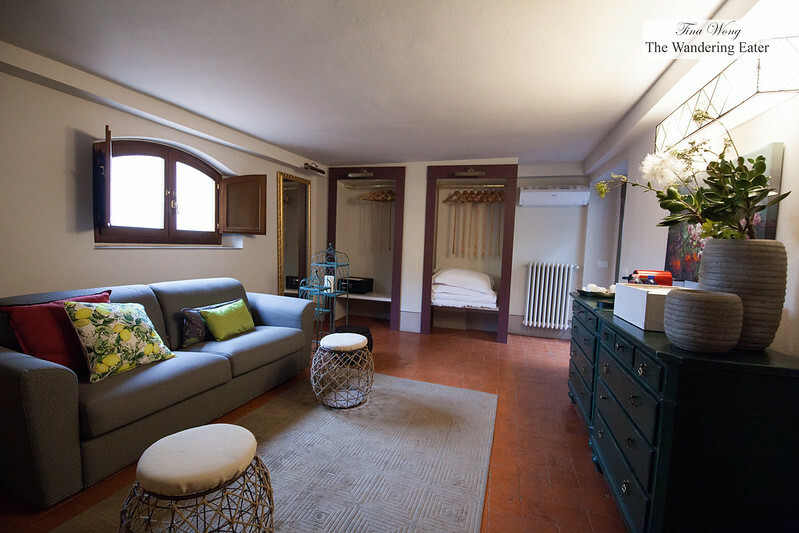 Inside the huge bathroom, it has a spacious walk-in shower with a large rain shower head, modern toilet, bidet and another large sink. Just to give you some general sense of size, the bathroom is about be the half the size of a studio apartment in Manhattan. The first floor room also has a Nespresso machine and water for a caffeine kick and some hydration. 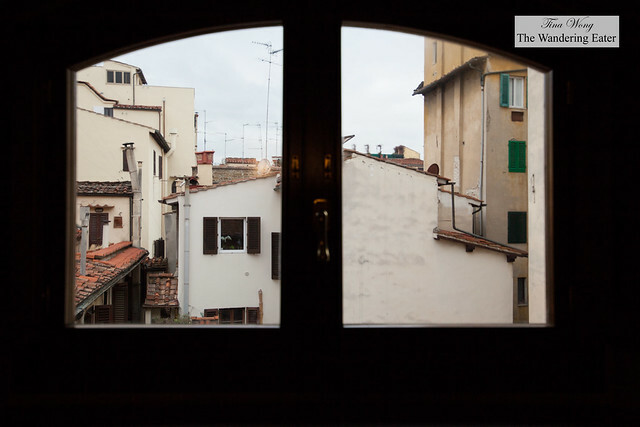 All of the rooms were very quiet from the bustle of the city, except when you hear the hourly chime of the bell tolls. 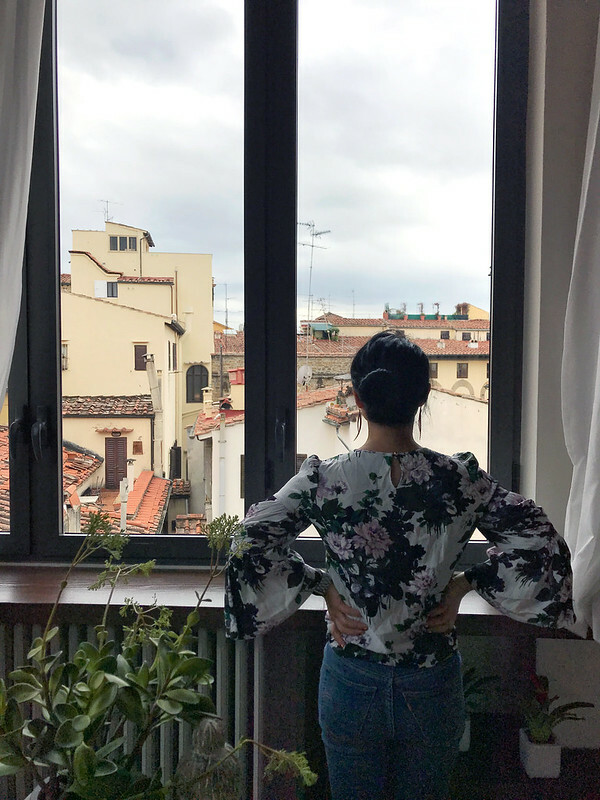 My traveling companion and I enjoyed our stay immensely because of Alessio’s warm reception and willingness to answer questions while we were there. 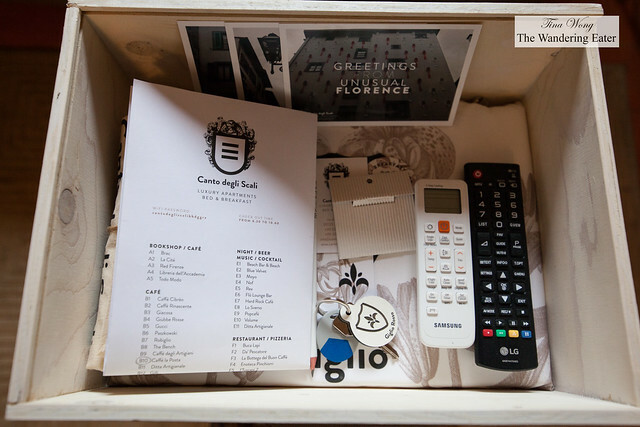 Part of our check-in welcoming package, included a curated list and map of places to eat and check out in Florence (curated personally by Alessio and his brother) and it helped us immensely when our plans changed and gave us options as to where to eat. 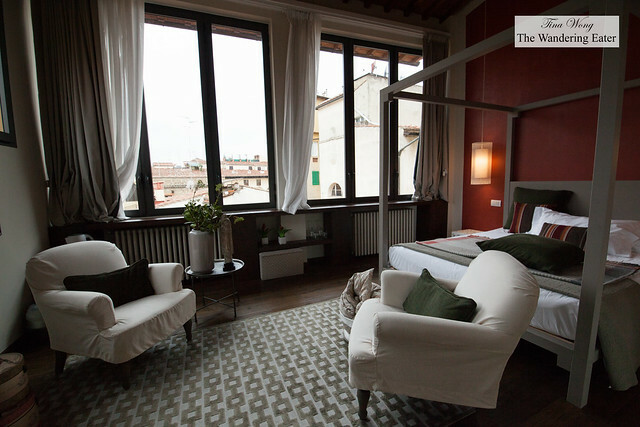 I definitely recommend staying here and would love to go back when I return to the beautiful city of Florence.